Fairly recently, a family of American tourists clashed with a policeman when they were giving out items of clothing to a group of sports fans in their regular meeting in the Parque Central park in Havana. Mr. Eliot Mackenzie with his wife Anna and his son Daniel were just presenting a young man named Yosbani with a pair of New Balance shoes when a uniformed man approached them, asking the lucky young man for his ID card. The family got really upset. Not only that the policeman disturbed their act of genuine kindness, but he also confiscated the shoes, which is a typical procedure of the authorities aimed at scaring local people off of any contact with foreigners. The general reaction was that of solidarity with the man who was asked to prove his identity. The father of the American family also argued that he had the full right to give his belongings to whomever he pleased, and to demonstrate this, he started giving away $ 10 bills to the people around. Finally, the policeman had no choice but to leave the park among strong protests of those who had gathered there. Rogelio Torrado, hotel porter of the Inglaterra hotel, said that based on the classification of the Ministry of Tourism, American tourists are the best customers with regard to giving tips, being friendly and demanding any kind of quality service. 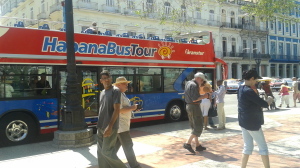 “They take much interest in the Cuban reality, they like chatting to Cubans in the street,” he said. Such comments suggest that Americans differ from other tourists in terms of their manners; they treat Cubans very warmly, they have no inhibitions and prefer staying away from the hotels. They pay cash and don’t bargain. Thus, despite having a great appreciation for American tourists (acknowledged with a fake smile), the authoritarian regime, heir to the pseudo-cultural legacy of taking control over everything, including details of stays of foreign tourists, likes to give them a proper “governmental welcome”.